On one of our regular visits to our local charity shop, I spotted this framed needlepoint. It was wedged in a basket at the back of a stack of picture frames and would probably have been consigned to the bin had I not rescued it. I was struck by the hours of work that had obviously gone into it and was disappointed, if not surprised, that the value that had been attributed to it was just ONE pound. Unfortunately, as a picture, it just does not work. It’s old-fashioned and the cheap gilded frame couldn’t be further removed from current interior trends, yet it totally misses the ‘vintage’ vibe, too. Without really thinking it through, I knew I had to buy it and try to reinvent it as something I would be proud to have in my home – no small task! A number of Instagrammars had the great suggestion to turn the needlepoint into a tray by adding handles to the frame, or a suitable alternative frame. 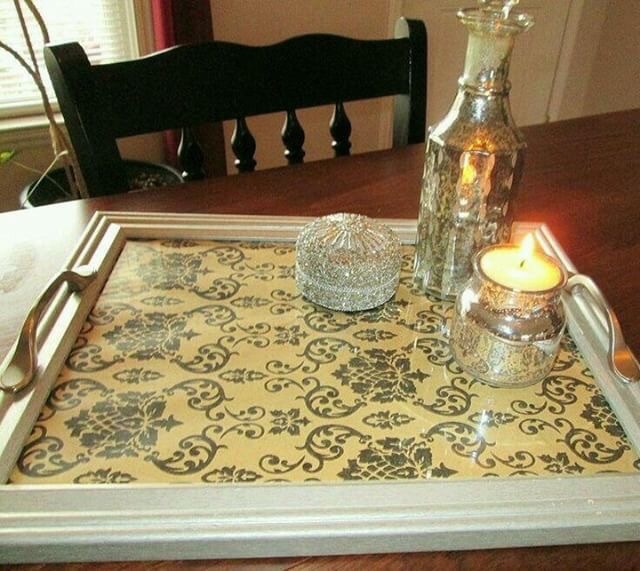 I love this idea and very nearly went for it until I was honest with myself and admitted that I have lots of trays and this one simply wouldn’t get used, which seemed such a shame. Going with my initial idea, I decided to turn it into a cushion cover, after all, the colours would tie in seamlessly with the ones currently in our lounge. 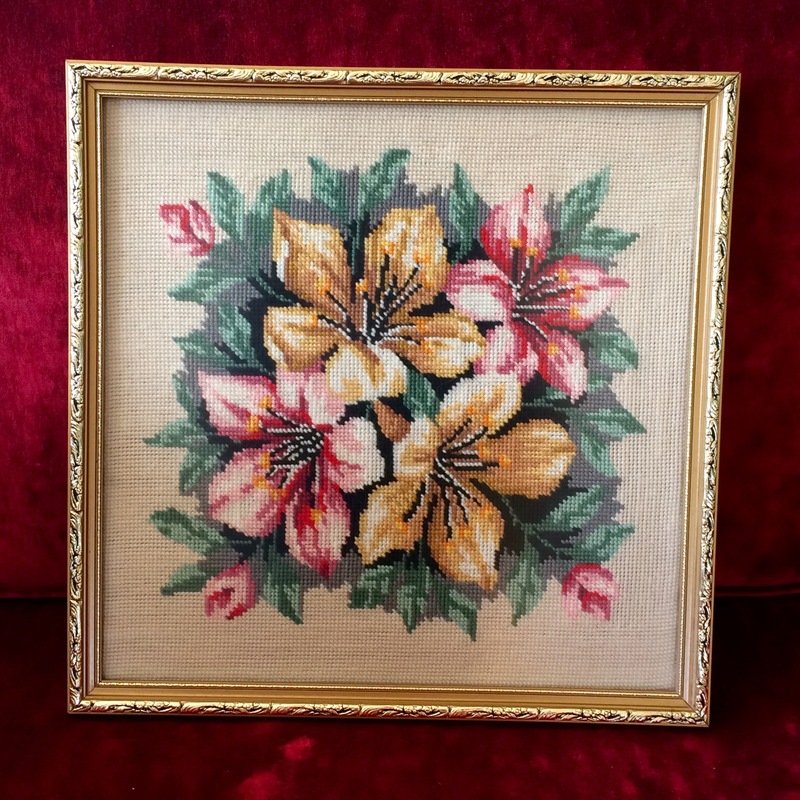 I started by running a blade around the edge of the backing to remove the needlepoint from the frame. The canvas had been criss crossed with thread to hold it in place, so I was careful not to cut through the canvas when removing the thread. 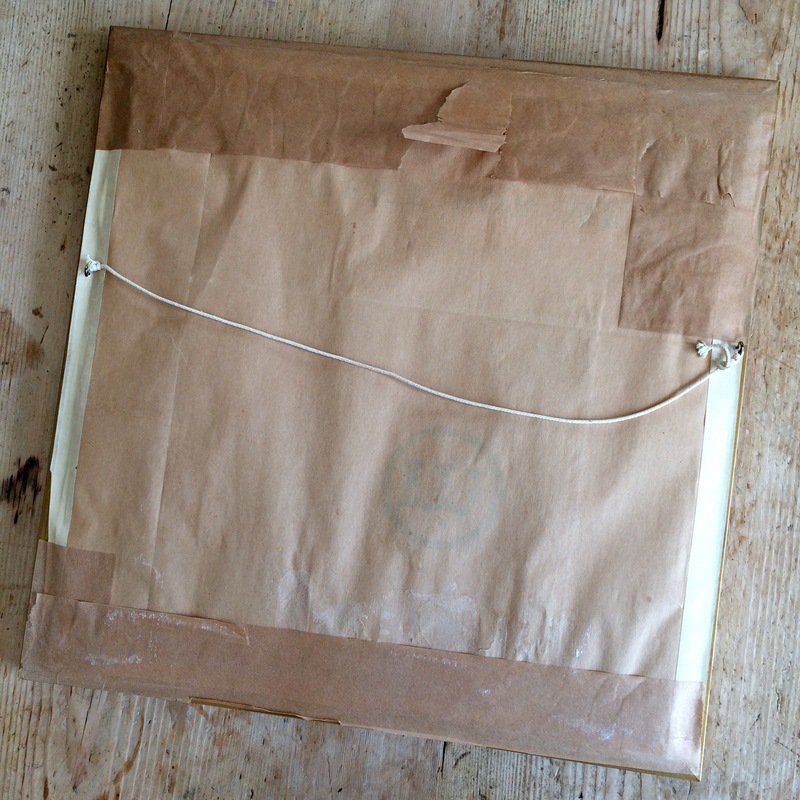 Having liberated the needlepoint from its frame, it was obvious that it had been a kit originally. I used the colour guides on the side of the panel to choose a fabric from my stash that would serve as the cushion back. 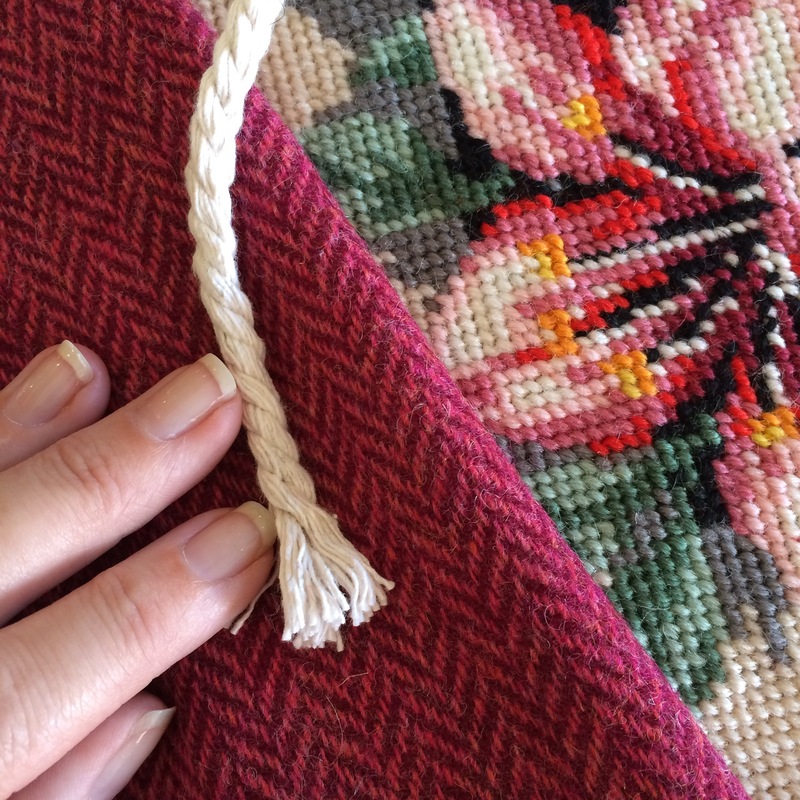 Luckily, this herringbone tweed matched the colours in the needlepoint exactly. There was just enough cord left on a roll to make some piping, too. 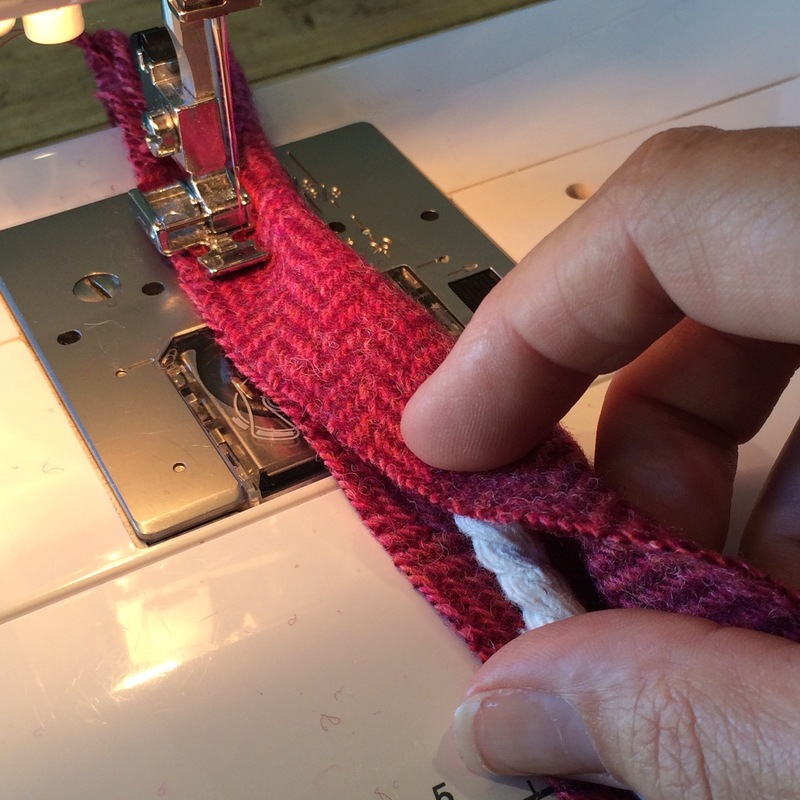 The piping cord was made first, by cutting strips of fabric on the bias and basting it around some cord. I basted the piping as close as possible to the edge of the needlepoint, clipping up to the stitching to turn the corners. 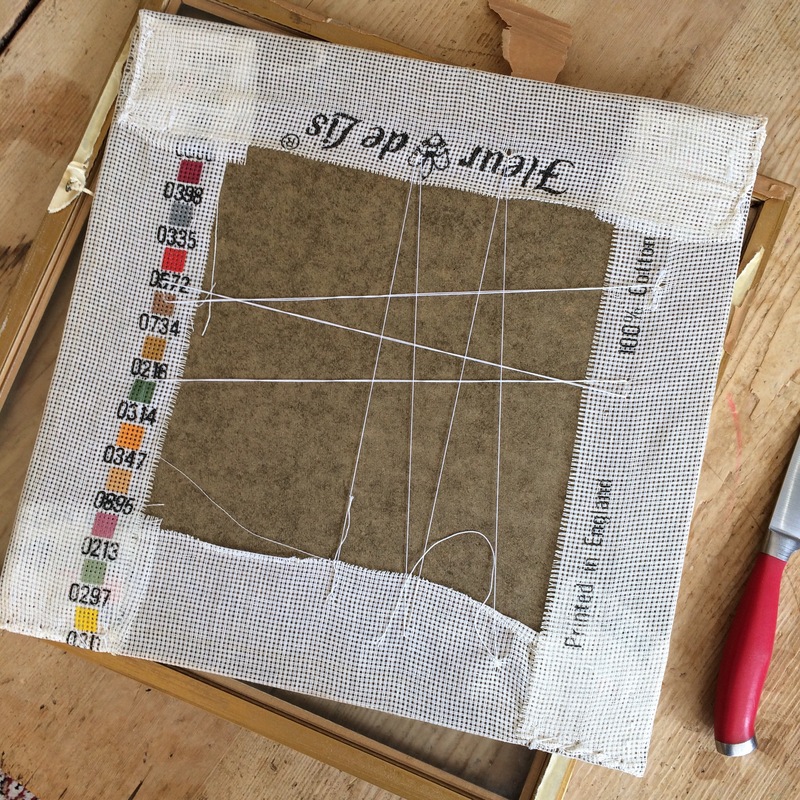 I had to piece the remnants together to make a 15″ square backing to match the size of the needlepoint front. 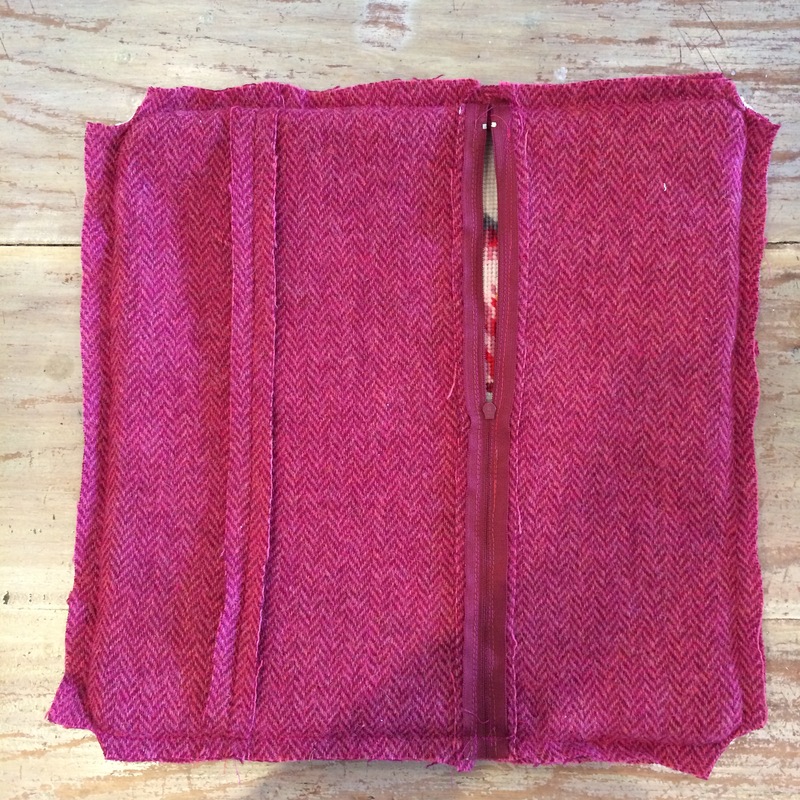 The zip was inserted into the back section rather than any one of the side seams to minimise bulk at the seams. I top stitched it down close to the zip to stop the fabric getting caught in the zip when removing the cover for cleaning. 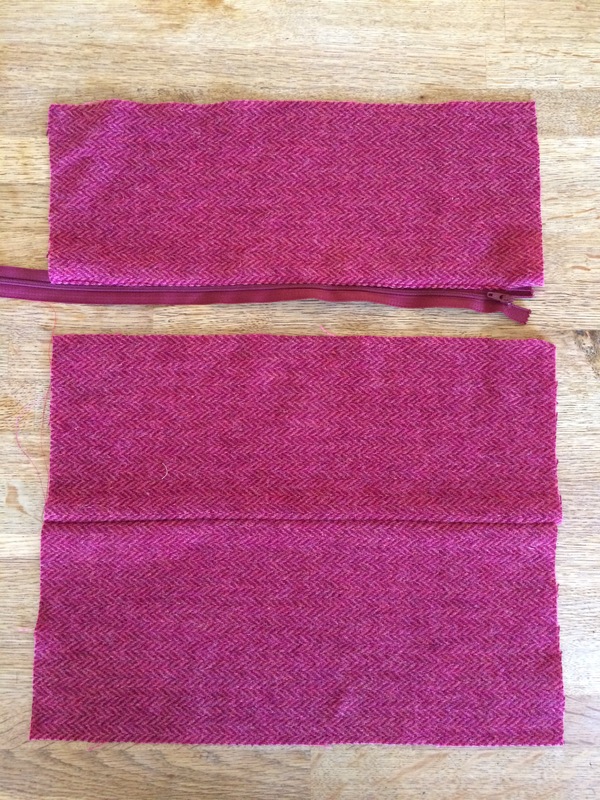 With right sides facing, I pinned the backing to the front, remembering to open the zip for turning through later. As the zip was too long, I would just sew all the way around, in effect creating a new zip stop in the seam, so I didn’t cut it to length at this stage. The excess canvas was trimmed and the corners were cut across. I think it will actually live on this sofa. When I said it coordinates with our existing colour scheme, here’s what I meant – it sits perfectly with the other cushions. I don’t know about you, but I don’t think it looks at all dated now, quite the reverse, in fact and I love it! Not so old fashioned now, is it?! 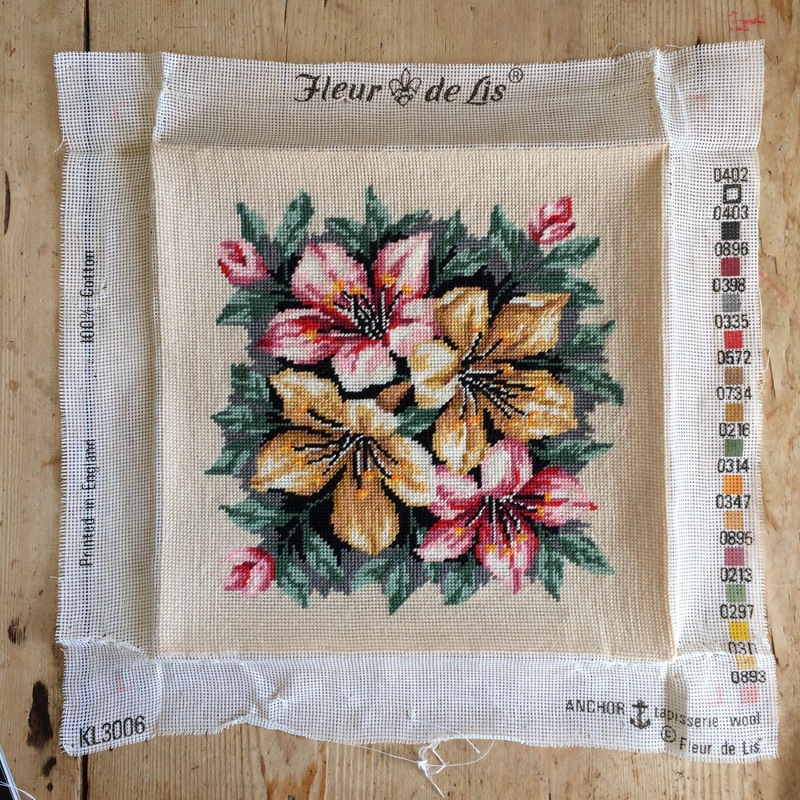 Categories: Sewing | Tags: charity shop, cushion, flower, lilies, lily, needlepoint, sewing, tapestry, upcycled | Permalink. I hate seeing crafted items in junk shops – a very poignant sight. I usually buy crochet blankets if they are done well and in good condition because I can’t stand to see all that work gone to waste. Last Saturday we did a fund raiser and I noticed that somebody had donated a bag for the bric-a-brac stall. It had been made by one of our fund raising team who often takes a stand to sell her lovely work on behalf of the charity 😮 If it wasn’t for the fact that I’d arrived late (reason to be explained in my next post) and I knew she’d already visited, I’d have whipped it off that table so she didn’t have to see it. 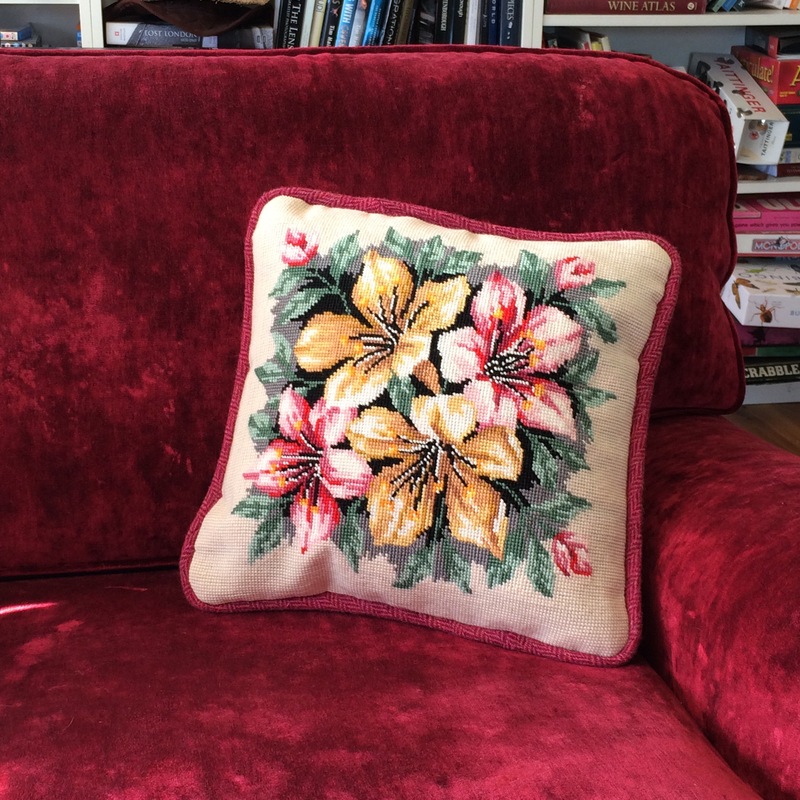 This was a brilliant save Sheila – it looks perfect on your sofa. I feel exactly the same so should probably stop going in charity shops – but I can’t resist the pull. I make lots of things for the school fair but NEVER run the stall. It could be upsetting when I see that the things I make are often priced at less than the material cost, let alone any allowance made for the time taken. I understand that items need to be priced low at a school fair, but it amazes me how little value is normally placed on handmade goods. 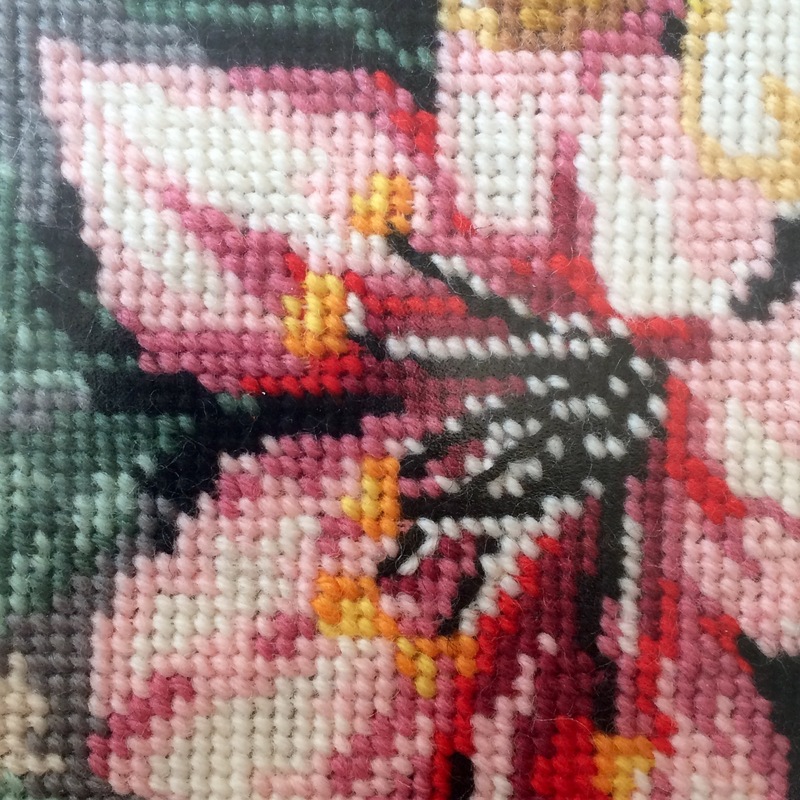 I also realise that tapestry/needlepoint/cross stitch items are ‘old fashioned’ in general…..but usually there’s a way to make them work. It looks so happy! 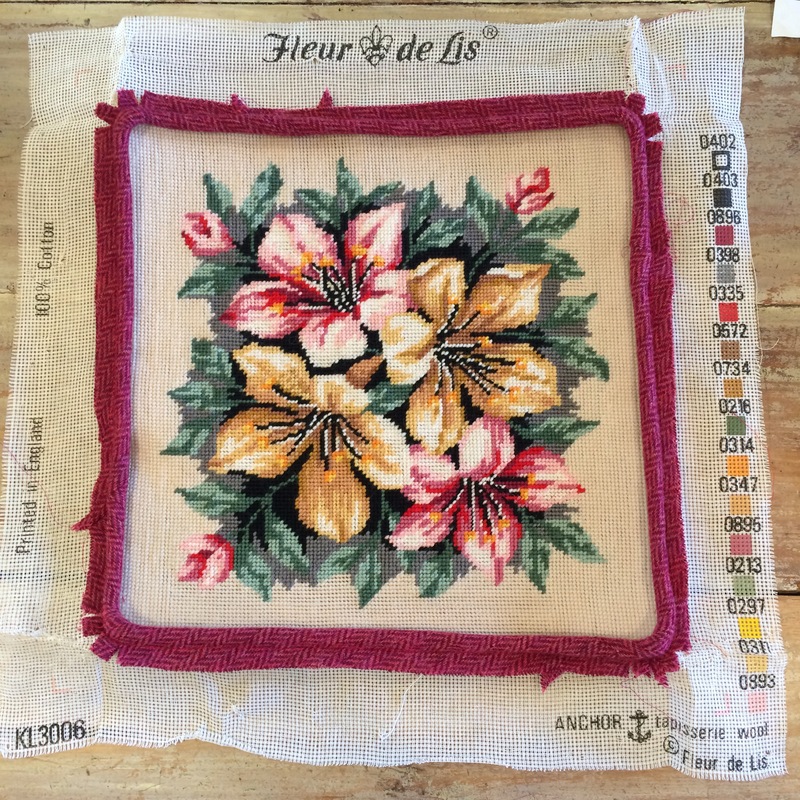 Beautiful upcycle – it makes my heart sing to know that the needlepoint has been saved. I keep saving these things from charity shops and can usually make them work in some way. I can’t bear to see all that intricate work go to waste, especially when you imagine all the hours and love that went into creating it initially. Awesome, awesome, awesome. I am so loving it! One would never ever have guessed it was something old. 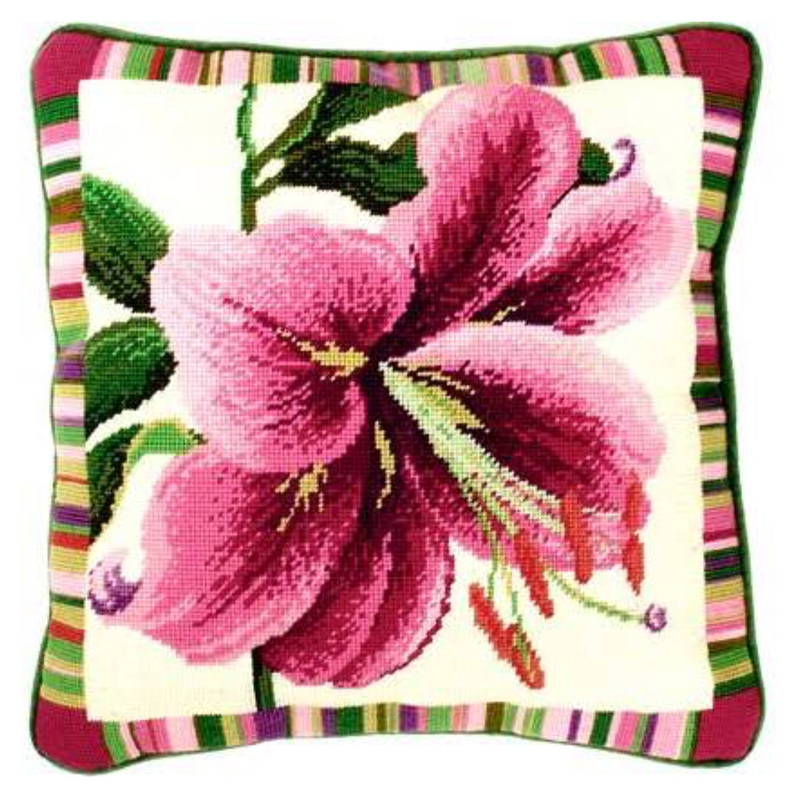 It looks like you spent hours doing the needlepoint, and then making the cushion. Very grand and very mod. And indeed, it does suit your colours perfectly. I’ve often considered doing my own needlepoint cushion so to be able to remake this old picture was fortuitous. Of course, I didn’t have the initial pleasure of making it, but the satisfaction of giving an old one a new lease of life is almost better. Have a happy weekend. I am going to start mine now! 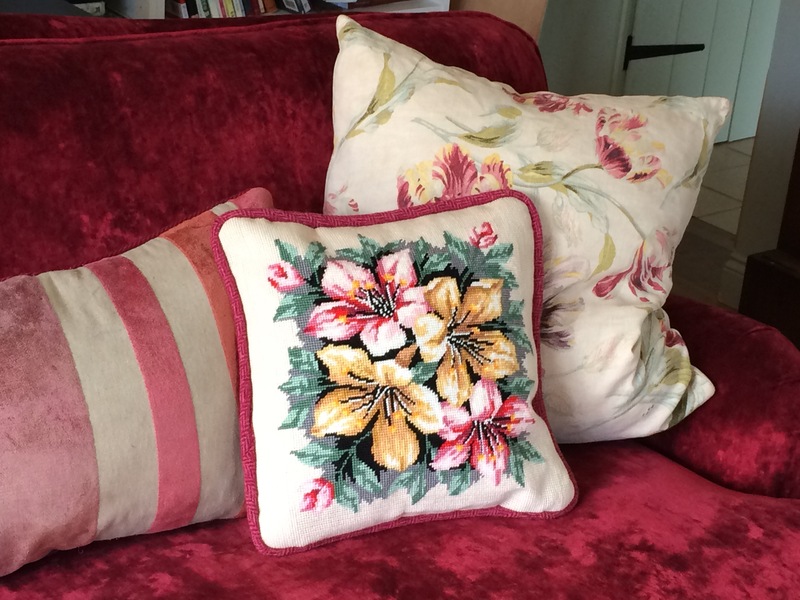 Great to see something that someone has worked so hard on being given new life – and it looks lovely on your sofas. Definitely, I was determined that it would be loved again! 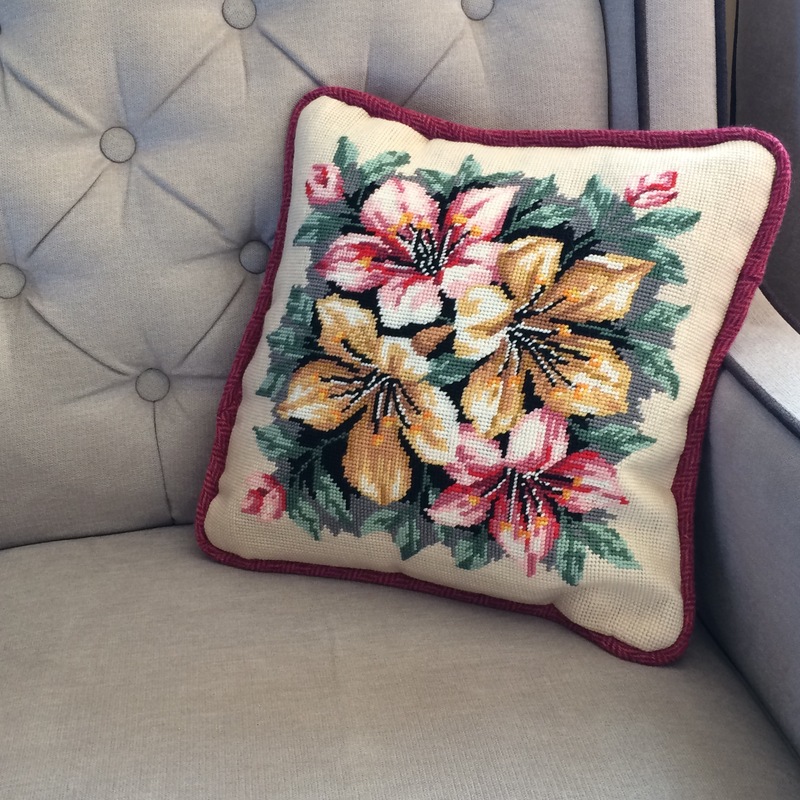 What a lovely way to use a forgotten needlepoint, the piping gives the perfect finish to your beautiful cushion. Thanks Kim, hopefully this will help people look at similar pieces in charity shops in a different light and maybe rescue some more. Thanks, I’m sure it won’t be the last piece I rescue. Not at all old fashioned now! Looks just lovely on your sofa. Thanks Jen, it looks quite at home there, doesn’t it? Me too, and I know we’re not the only ones. Hopefully, this will inspire others to breathe new life into old pieces of stitching. I love this on so many counts. First I have done needlpoints like this and know you are looking at at least three months work, and you saved it from landfill. 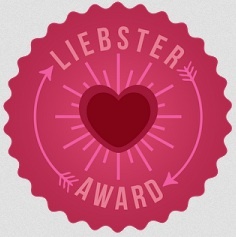 The person who made it would have been devastated that her work was not valued by her nearest and dearest, but totally thrilled that somoneone appreciated it, and for that I salute yoy. Then you made a lovely cushion, beautifully crafted and that too I love. Aw, thanks Cathy, that’s how I looked at it in the charity shop, just shoved into a dump bin as a last attempt to get rid of it and not valued by anyone. To be fair, the elderly lady volunteers expressed how glad they were that someone wanted it and were quite excited when I mentioned turning it into a cushion. Take it in for them to see, might open their eyes to possibilities. 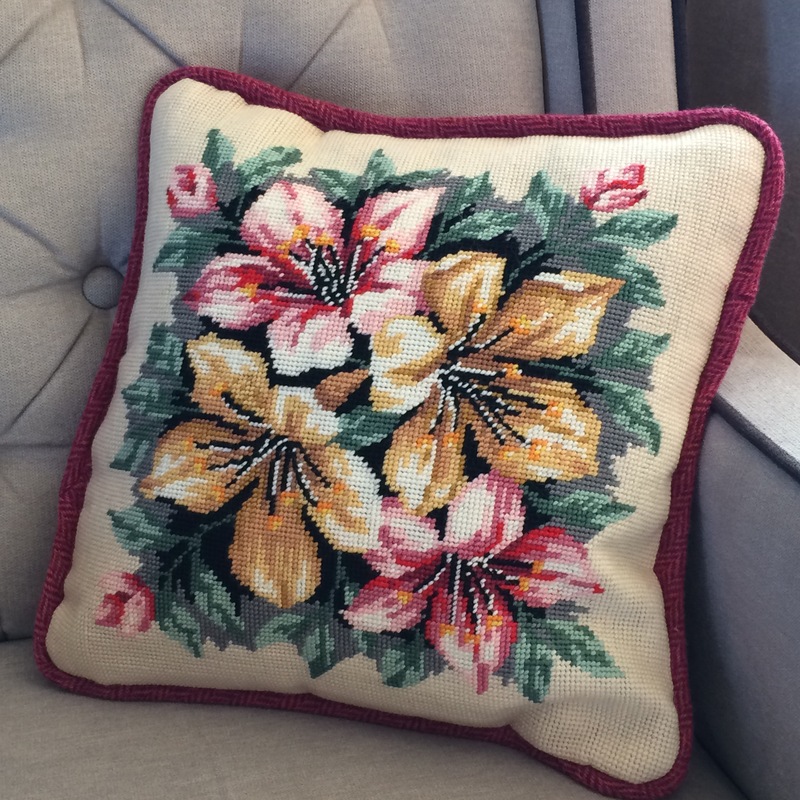 Did you clean it before sewing it into the cushion and if so, how? It is beautiful and such a wonderful way of honoring the original creator. If her heirs didn’t value her work, she’d be happy to know that somebody did! There is a store nearby called Fabric Recycles that buys craft and needlework WIPs as well as fabric and notions. So many loved projects and stashes are found in that store. Bags upon bags of quilt blocks waiting to be sewn together, cross stitch and needlepoints partially done….you get the idea. I might have to take a closer look next time I’m in to see if I can find something as lovely as yours. I didn’t clean it beforehand because it had been totally enclosed and protected by its frame – it didn’t even smell musty. I’m hoping that this post will encourage others to find a modern way to display these old pieces so they’re kept for posterity. I LOVE the sound of Fabric Recycles! Where is it? It’s in Overland Park, Kansas…a suburb of Kansas City. 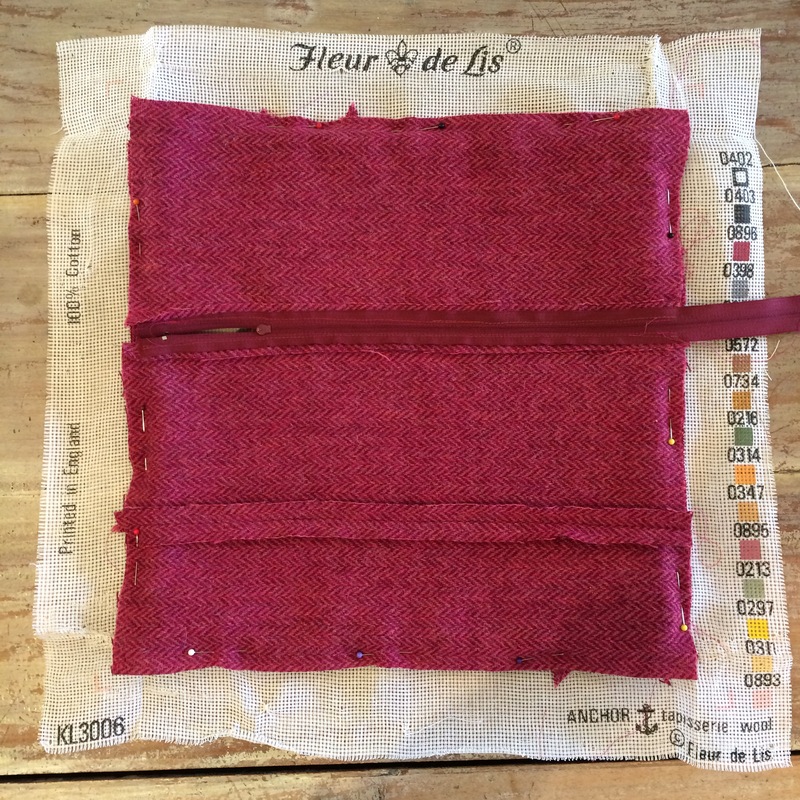 There is enough unwanted stash fabrics out there that the store has two locations! Oh blimey, I was thinking I’d like to pop in…..but it’s a bit far from England! Well done for saving this and cushion is lovely, I think piping always makes a cushion look so much more professional. I have bought several half finished embroidered tablecloths from charity shops but as yet not managed to finish or upcycle them. I agree about piping giving a better finish, although I have a mixture on my sofas. I must admit to having lots of embroidered linen that I’ve found in charity shops, too, yet to be reinvented. Embroidered chair backs just won’t cut it nowadays! Mum calls chairs backs antimacassars, she always had them! Love this idea! I’m definitely going to have to remember this. Just shows that nothing is ever ‘passed it’, there’s a new lease of life in everything! It’s definitely worth a try, anyway. I’m not saying I could revamp everything in the charity shop, but things like this are worth a go! 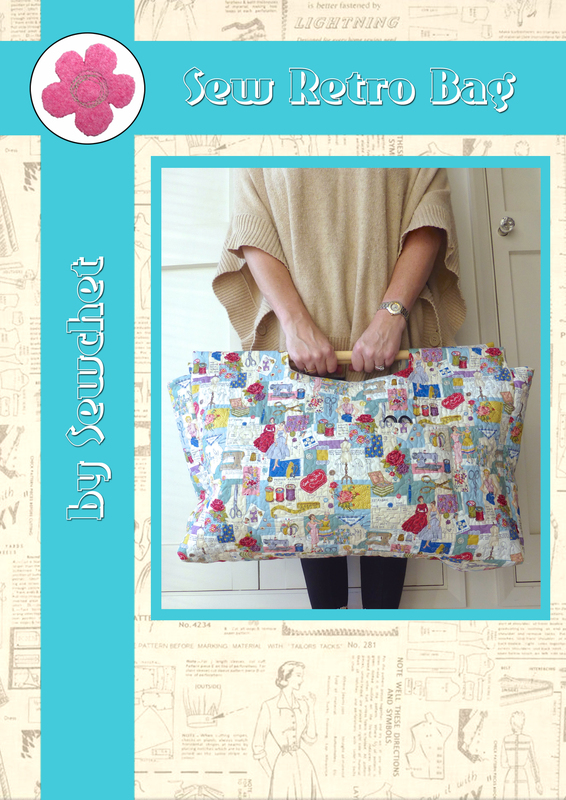 Sheila, what beautiful upcycling! I love this as a pillow and you’re right, what a perfect color match. I’m so glad you rescued it from the bin. Thank you, although it’s nothing like as creative as the brilliant ideas you come up with all the time. It didn’t deserve to be discarded, that’s for sure, so I’m glad that it sits so well on our sofa enjoying a new lease of life.